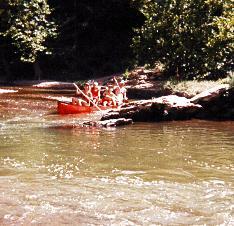 Maps and Rental Rate for Cabins, Camping and Canoes on the Ouachita River in Arkansas. "We can customize your trip for you"
Option 2:1 day float including breakfast, lunch, dinner & 1 night cabin. Option 3: One day float including 4 meals and 2 nights cabin. Option 4: One day float and one hiking or biking shuttle, 7 meals, 3 nights cabin. All prices based on double occupancy and exclude tax. Cabin A/C in our private riverfront campground. Covered dining pavilion, showers with restrooms & group fire ring with complimentary firewood. 10' x 12' wooden shelters, concrete floors, 4 windows, air conditioned, bunks with mattresses, electric outlets and lights. Things You Need to Bring! Ice Chest with your favorite beverages; hat, sunscreen, swimsuit, towel and personal items. Be sure to bring zip-lock plastic bags or plastic bags to waterproof your personal items. (Campers need sleeping bags or bedding and lawn chairs). Eggs, bacon, fried potatoes, biscuits & coffee. Grilled 14-16oz steak, baked potato, vegetable & roll. "Featuring the fastest water on the Ouachita"
Take U.S. Hwy 270 W. through Mt. Ida; approx. 5 miles, turn right on Ark 298. Go 1/4 mile & turn right on Pucket Bend Rd, go approximately 2 1/2 miles to end of road. Turn left and follow for 1/2 mile (keep left at Pucket Bend sign) to end of road. Turn right, campground is 200 yds on left.